Zoloft (Setraline) Cautions: SEVERAL WEEKS MAY PASS before Zoloft (Setraline) reaches its full effect. Do not stop takingZoloft (Setraline) without checking with your doctor. Zoloft (Setraline) MAY CAUSE DROWSINESS. DO NOT DRIVE, OPERATE MACHINERY, OR DO ANYTHING ELSE THAT COULD BE DANGEROUS until you know how you react to this medicine. Using Zoloft (Setraline) alone, with other medicines, or with alcohol may lessen your ability to drive or to perform other potentially dangerous tasks. 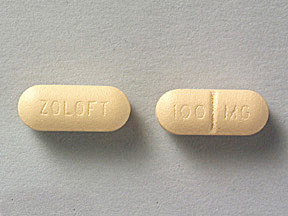 Zoloft (Setraline) WILL ADD TO THE EFFECTS of alcohol and other depressants. Ask your pharmacist if you have questions about which medicines are depressants. KEEP ALL DOCTOR AND LABORATORY APPOINTMENTS while you are using this medicine. DO NOT START OR STOP ANY MEDICINE, either prescription or over-the-counter, without doctor or pharmacist approval. Caution should be used in the elderly since they may be more sensitive to the effects of this drug, including a decrease in sodium levels in the blood, especially if they are also taking "water pills" or diuretics. Caution should be used in children since they may be more sensitive to the effects of this drug, especially loss of appetite and weight loss. It is important to monitor weight and growth in children who are taking this drug. FOR WOMEN: IF YOU PLAN ON BECOMING PREGNANT, discuss with your doctor the benefits and risks of using this medicine during pregnancy. IT IS UNKNOWN IF THIS MEDICINE IS EXCRETED IN BREAST MILK. IF YOU ARE OR WILL BE BREAST-FEEDING while you are using this medicine, check with your doctor or pharmacist to discuss the risks to your baby.